A computer application that replaced paper worksheets is called a spreadsheet. It shows multiple cells that together make up a grid consisting of rows and columns, each cell containing either alphanumeric text or numeric values. A spreadsheet cell may otherwise hold a formula that classifies how the contents of that cell is to be calculated from the contents of any other cell (or combination of cells) each time any cell is updated. Spreadsheets are often used for financial information because of their capacity to re-calculate the entire sheet automatically after an alteration to a single cell. If you think that the proprietary and expensive Microsoft Excel is the only available and capable spreadsheet software, then think again because you are wrong. 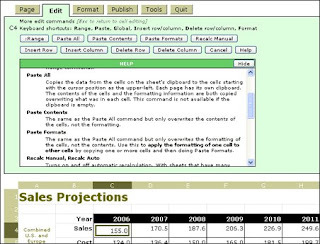 There are quite a number of free/open-source spreadsheet programs that are almost as good or even at par with Excel. Gnumeric is part of the GNOME desktop and has Windows installers available. It is intended to be a free replacement for proprietary spreadsheet programs such as Microsoft Excel, which it broadly and openly emulates. Gnumeric has the ability to import and export data in several file formats, including CSV, Microsoft Excel, HTML, LaTeX, Lotus 1-2-3, OpenDocument and Quattro Pro; its native format is the Gnumeric file format (.gnm or .gnumeric), an XML file compressed with gzip. It includes all of the spreadsheet functions of the North American edition of Microsoft Excel and many functions unique to Gnumeric. Pivot tables and conditional formatting are not yet supported but are planned for future versions. Gnumeric's accuracy has helped it to establish a niche among people using it for statistical analysis and other scientific tasks. For improving the accuracy of Gnumeric, the developers are cooperating with the R Project. 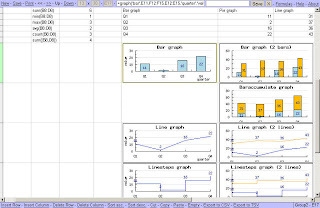 GNU Oleo is a lightweight free software spreadsheet software package. Oleo was originally designed as a text-based spreadsheet (using the curses library). Oleo is much older than the GNU Gnumeric spreadsheet (a part of the GNOME desktop system) and has fewer capabilities. It is also not as active as a project, not having had a release since 2001. KSpread is part of KOffice, an integrated office suite for the KDE Desktop Environment. KSpread native format is XML, compressed with ZIP. 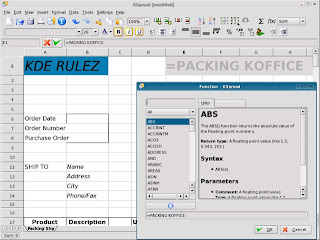 However, KSpread has the ability to import in several spreadsheet formats, including Microsoft Excel, Applix Spreadsheet, Quattro Pro, CSV and OpenOffice.org Calc. 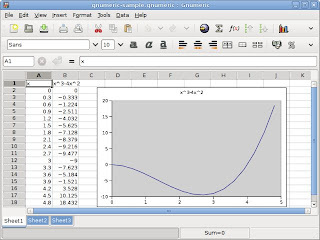 OpenOffice.org Calc is a component of the OpenOffice.org software package. Calc is similar to Microsoft Excel, with a roughly equivalent range of features. Calc is capable of opening and saving spreadsheets in Microsoft Excel file format. 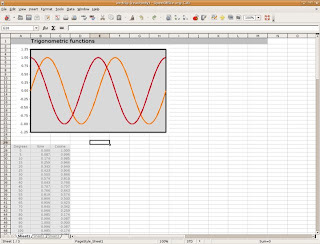 It provides a number of features not present in Excel, including a system which automatically defines series for graphing based on the layout of the user's data. Calc is also capable of writing spreadsheets directly as PDF files. The default file format for OpenOffice.org 2.0 Calc can be set to either Microsoft Excel or the OASIS Open Document Format (ODF). Calc also supports a wide range of other file formats, for both opening and saving files. 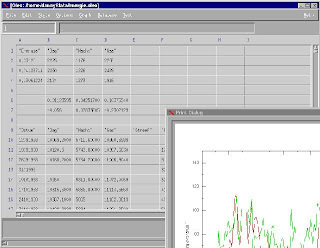 As with the entire OpenOffice.org suite, Calc can be used across a variety of platforms, including Mac OS X, Microsoft Windows, Linux, FreeBSD and Solaris. Available under the GNU Lesser General Public License, Calc is free software. SIAG (Scheme in a grid) is a spreadsheet using a SIOD engine or base. The grid, siag is fast and very configurable. Suitable for small unix distributions, it was selected by DSL to provide a spreadsheet inside their fifty megabyte system footprint. Consequently, siag can be used on older PCs with their limited memory and disk space. 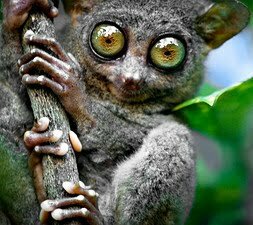 Language modules for C, SIOD, Guile, Python, Ruby, Tcl, etc. permit extensive control over input and output data. Any unix shell can further script siag grids to display cells in algorithmic form. Simple Spreadsheet can be used with all common browsers like Firefox, Opera, Konqueror, and Internet Explorer. Safari may be used, but was not yet tested. The product was envisioned in 2005 by Bricklin, who 27 years earlier created VisiCalc, the first commercial spreadsheet program for the personal computer. Version Alpha 0.1 was released for alpha testing in November 2005. Version 1.0 was released on January 25, 2007. wikiCalc is written in the Perl programming language. Thanks Giles for the comment. I will be checking out Resolver One soon. Thanks.